Ford was America’s best-selling brand but Ford Motor Company’s overall market share in the United States was 18.4% in June 2011, two points down from General Motors. Next up was the Chrysler Group, including Fiat, with 11.4%. It was GM, however, which lost market share from May – Dearborn’s FMC and Auburn Hills’/Italy’s Chrysler Group both improved slightly. Though Toyota and Lexus sales slid hard in June, Toyota Motor Corp.’s share of the U.S. automobile market grew from 10.2% in May to 10.5% in June. 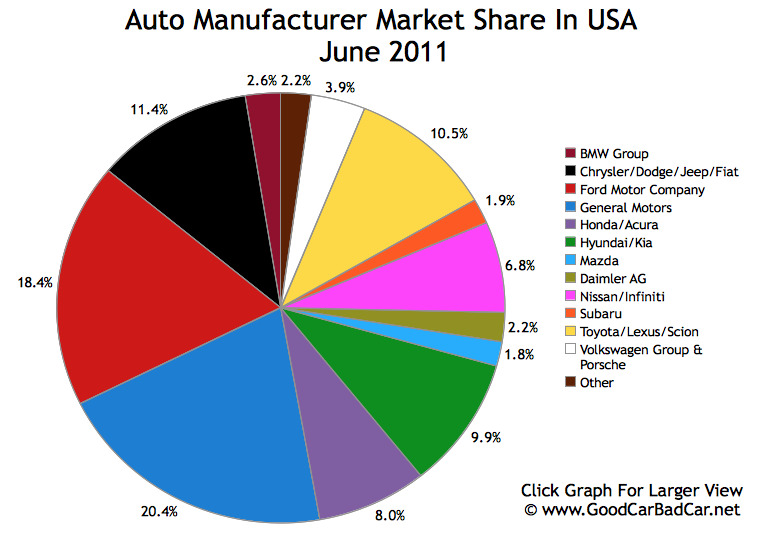 American Honda’s market share was in decline, as was Nissan’s and the VW family’s. And as is discussed frequently on GoodCarBadCar.net, Ford owes much of its impressive market share figure to the F-Series line. More than a quarter of all Ford sales were full-size trucks. In fact, the F-Series out-sold Ford’s extensive line of utility vehicles by 1852 units. Americans acquired 1,053,405 new vehicles in June 2011. How those sales were split can be seen in the market share chart below.